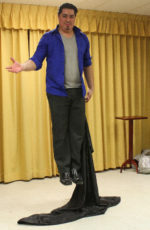 Bancroftians packed the Legion for a chance to see magician Diego Lopez last week. The show was held by Bancroft Community Transit March 24 to fundraise for youth transportation — non-emergency transportation for youth to attend activities after school and on weekends both accessible and non-accessible, according to BCT’s website. The proposed quarry by Freymond Lumber Ltd. will be the largest source of greenhouse gas emissions in the Bancroft area with up to 60 vehicle and diesel truck trips per hour/day/week/month/year for 50 years (Traffic Impact Study of Nov. 2016). All the world’s leading scientists, 136 nations of the Paris Agreement, the United Nations and the majority of people all over the world agree that we must reduce our GHGs by 80 per cent as soon as possible to save our common future for our children. One summer bees moved onto our property. A half dozen beautiful, intricate honeycomb nests dotted a portion of our forests. After years of heavy taxation and shamefully neglected services by the Township of Hastings Highlands people are looking for better options. The Kamaniskeg Area Property Owners Association has undertaken research into the feasibility of a realignment of a portion of the former Bangor Township with the Township of Madawaska Valley. Freymond Lumber Ltd. hosted a public information session March 20 for its proposed quarry in Faraday township. Those who attended could inquire on analyses by consultants on visual, hydrogeological, natural environment, archaeological, traffic, blasting and noise impacts to the area and its residents. With the information session complete, the public and agencies can submit letters of support or objection to MNRF until April 3. Hastings Highlands council has decided council will be elected at-large in 2018. Also see: Capital budget approved; Council increases grant transparency; and Council creates committees. The Maynooth and Hastings Highlands Business Association is hoping to hear from local businesses and residents on how to improve tourism in the area. There was an audience for the meeting of Bancroft council again. In fact, there were two audiences: one in the morning for a presentation against the possible sale or opening up of the Dungannon landfill, and one in the afternoon for the proposed re-zoning of Maple Street. On March 14, the executive board of the Shamrock Club had a meet and greet with MP Mike Bossio.